Pattaya PropertyPattaya was once a quaint fishing village, which through the years, have become one of Thailand’s most popular tourist towns. With excellent property values, modern medical assistance and not to far from Bangkok. What sets it apart from the rest is that it has traditionally been a resort destination for Bangkok families. The typical hedonism associated with other foreigner-oriented spots in Thailand is still strongly felt in Pattaya but this is coming to a slow end. The town is noted for its parks, waterfalls, nostalgic architecture, excellent golf courses, and high end weekend homes. Pattaya is also host to a growing expat community which has brought about a boom in the holiday and retirement housing business. Owning a Hua Hin real property is the dream of many foreigners and in fact many of them have successfully invested in condominiums, villas and apartments. The enthusiasm of foreign buyers is understandable. These westerners have found paradise in Pattaya with its sun-filled days and beautiful beaches; and with the strong buying power of western currencies, a lovely home in a well-planned subdivision is for them, easily obtainable. Without doubt, a piece of property in Pattaya is a worthwhile investment, however foreigners need to take extra caution as they are highly vulnerable to the schemes of some dishonest developers and sellers. A buyer must make sure that before he finalizes a property purchase, due diligence for Pattaya property has been performed by a trustworthy lawyer. Due diligence is a process whereby a thorough and systematic investigation of a property property is done to determine its potential and security prior to finalizing a transaction. A lawyer performs the task of finding out all the information available on the piece of real estate property a buyer is intending to purchase and validating claims made by the seller. Due diligence for property includes doing a background check on the title of the property as well as on the seller. A physical inspection of the place is part of the process. This allows the buyer to see for himself the condition of the place and to find out important answers to questions such as whether the place needs repairs, how the neighboring establishments or structures would affect his intended purpose for the property, whether it is easily accessible or not, and other relevant concerns. The information gathered from the exercise of due diligence for property can be used by the buyer to gain concessions from the seller or negotiate for a better price. A foreigner who invests in due diligence before finalizing a property transaction will be protected from entering into a problematic situation which may cause him serious financial and legal problems. If you are thinking about purchasing property in Pattaya or any part of Thailand for that matter, it is wise to enlist the services of a competent and trustworthy lawyer. 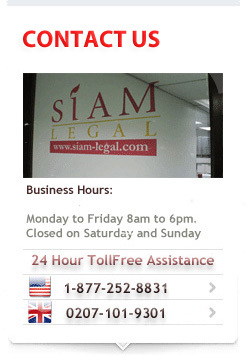 Siam Legal International is a reputable law firm with a team of attorneys who specialize in handling property transactions for foreigners in Thailand including due diligence for property in Pattaya.